Over the last nine years, EY, in collaboration with the Institute of International Finance (IIF), has monitored the banking industry’s approach to risk management through our annual surveys. 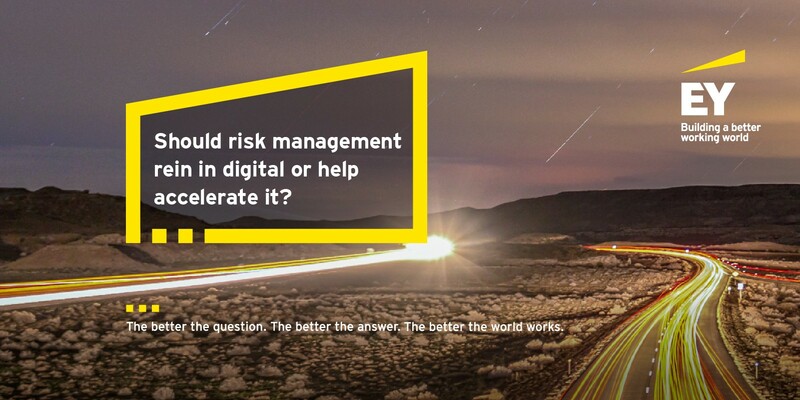 Our latest global bank risk management survey report, titled Accelerating digital transformation: four imperatives for risk management, finds that the pace of change for firms is speeding up. Fuelled by the industry’s digital transformation, along with shifts in geopolitics, macroeconomics and social issues, firmwide transformation is also accelerating. Risk management has a key role to play in that transformation. The survey finds that risk groups link strategy and risk appetite (67%); identify forward-looking or emerging risks (53%); assess strategy and business models from a risk appetite perspective (36%); help influence firm risk culture and behaviours (34%) and implement effective risk management structures (31%). “The overriding theme for this year’s report is around quality of decision making and the role of risk in that process. As banks globally have struggled out of a period of restoration, they are seeking to rationalise their business models as part of an inevitable transition into a period of industry reinvention. Capital, liquidity and governance have been significantly enhanced although customer trust is still a major challenge – taking time to rebuild. Nevertheless the focus is now on value, talent and transparency of decision making with the bank risk function being very much part of the discussion. Cyber related risks along with other non-financial risks have risen dramatically up the agenda – along with conduct, third party risk management and data privacy. Whilst EU banks are still challenged by their regulators around their business models, North American institutions are more focused on operational risk, not least because of the intention under Basel 3 to make operational risk a more material part of the capital calculation. If you have a question about any of the issues raised, don’t hesitate to get in touch.